This story looks like another media hoaxer like the 6 Sunni story that was fabricated or the Ramadi soccer field slaughter that was made up. So far this morning the Tal Afar massacre story has been reprinted some 763 times. 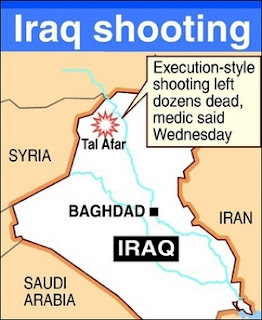 BAGHDAD – Shiite militants and police enraged by massive truck bombings in the northwestern town of Tal Afar went on a revenge spree against Sunni residents there Wednesday, killing as many as 60 people, officials said. The gunmen began roaming Sunni neighborhoods in the city, shooting at residents and homes, according to police and a local Sunni politician. Ali al-Talafari, a Sunni member of the local Turkomen Front Party, said the Iraqi army had arrested 18 policemen accused of being involved after they were identified by the Sunni families targeted. But he said the attackers included Shiite militiamen. He said more than 60 Sunnis had been killed, but a senior hospital official in Tal Afar put the death toll at 45, with four wounded. The hospital official, who spoke on condition of anonymity due to security concerns, said the victims were men between the ages of 15 and 60, and they were killed with a shot to the back of the head. Police said earlier dozens of Sunnis were killed or wounded, but they had no precise figures, and communications problems made it difficult to reach them for an update. The shooting continued for more than two hours, the officials said. Army troops later moved into the Sunni areas to stop the violence and a curfew was slapped on the entire town, according to Wathiq al-Hamdani, the provincial police chief and his head of operations, Brig. Abdul-Karim al-Jibouri. So why would you question this horrible massacre story? Because the Associated Press claims that the Shiites were “enraged by massive truck bombings in the northwestern town of Tal Afar”. However, media accounts about the truck bombings that murdered the innocents in the Tal Afar market the day before were reportedly against “Anti-Qaeda Sunni forces”. BAGHDAD (Reuters) – Suspected al Qaeda militants in Iraq killed 21 people on Tuesday in bomb attacks targeting Sunni Arab tribes who have formed an alliance against the hardline Islamist group, officials said. If Tuesday’s attacks targeted anti-Qaeda Sunnis, why would Shiite policemen go on a execution style rampage in the city??? This smells like a skunk! MNF-Iraq does not have anything posted on this story at this time. Shiite militants and police enraged by massive truck bombings in Tal Afar went on a revenge spree against Sunni residents in the northwestern town Wednesday, killing as many as 60 people, officials said. The gunmen roamed Sunni neighborhoods in the city through the night, shooting at residents and homes, according to police and a local Sunni politician. Witnesses said relatives of the Shiite victims in the truck bombings broke into the Sunni homes and killed the men inside or dragged them out and shot them in the streets. Notice how now the story has evolved into a massacre of “Shiite militia” and policemen! Keep an eye open for more changes to the story. IraqSlogger reports that Al-Maliki is investigating into whether police were involved in the rampage. Gunmen rampaged through a Sunni district of the northwestern Iraqi town of Tal Afar overnight, killing about 50 people in reprisal for bombings in a Shi’ite area, Iraqi officials said on Wednesday. Prime Minister Nuri al-Maliki, a Shi’ite, ordered an inquiry into reports the gunmen included policemen from his Shi’ite- dominated security forces, an official in his office said. Update 3: Confederate Yankee believes the story is at it appears- a horrible slaughter by Shia policemen. I do thank him for the Ramadi tip which I took down. And, Confederate Yankee is a terrific investigator. There is a HUGE difference between “Shiite policemen” dragging Sunnis from their homes and executing them, and “Shiite militants” or “militants in police uniforms” executing the Sunnis. There are still too many questions about this story to know for sure. Right now it is still not clear what happened. I wrote MNF-Iraq to ask about this tragedy and have not heard back as of 10:00 PM CST. Also, just because al-Maliki sent in an investigation team means nothing at this point. And, there are still no pictures from Tal Afar which is common after an attack with the media we have operating there. Update 4: It looks like I may have been off a bit on this one. Although it does not appear that all of the attackers were policemen as originally reported today Reuters is reporting that some of the attackers were apparently police officers.